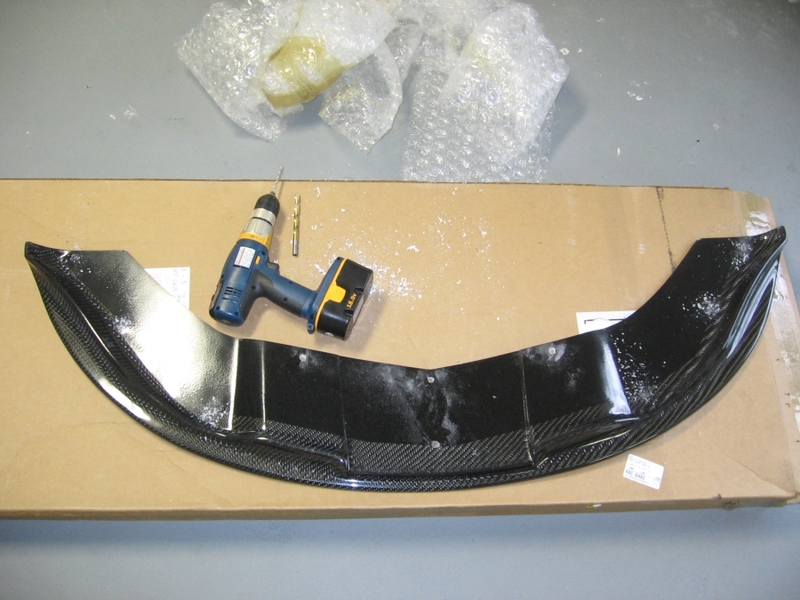 After unpacking it I found the spoiler quite sturdy compared to some other carbon fiber pieces I have used in the past. The spoiler comes with no hardware or instructions. 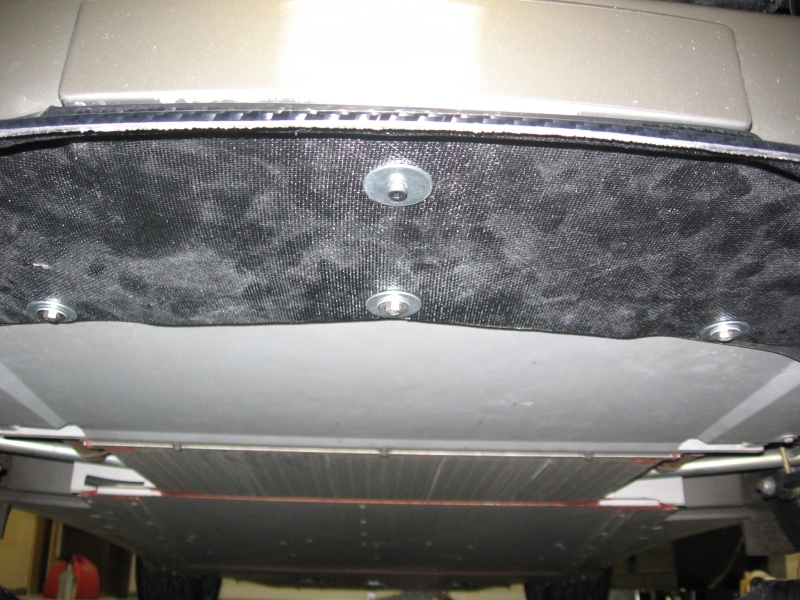 The spoiler does not come pre-drilled but there are dimples where holes are required. I drilled 3/8" holes in the middle rear and 3/16" holes in the front of the spoiler. The 3 middle rear holes utilize the existing bolts for the clam/undertray and were drilled slightly larger to allow alignment movement. A trip to the hardware store was required for 7- hex-head bolts (5mm x 20mm), 14- stainless steel fender washers, and 7- 5mm stainless steel nuts. 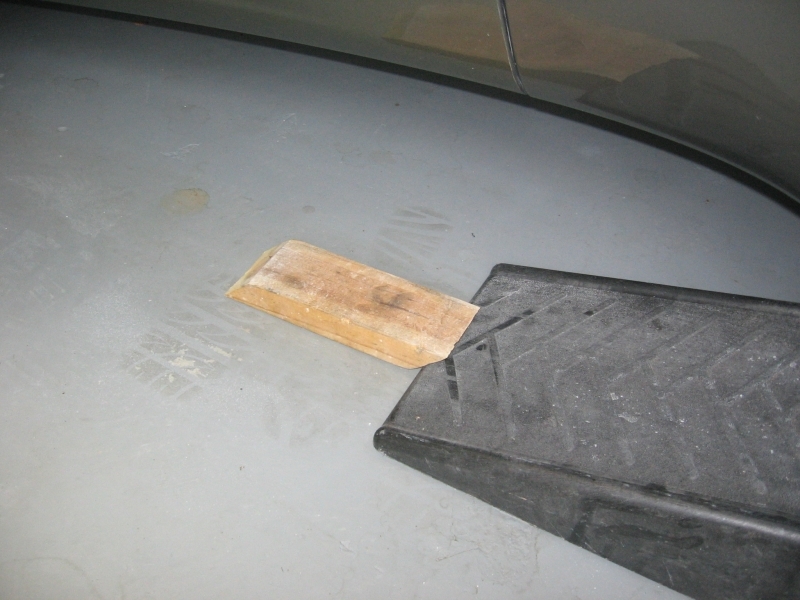 I started the installation by driving the car up on ramps, I went ahead and placed the helper ramps constructed from 2" x 4" with 45 degree ends at the base of the ramps knowing they would be required for backing down post-install. 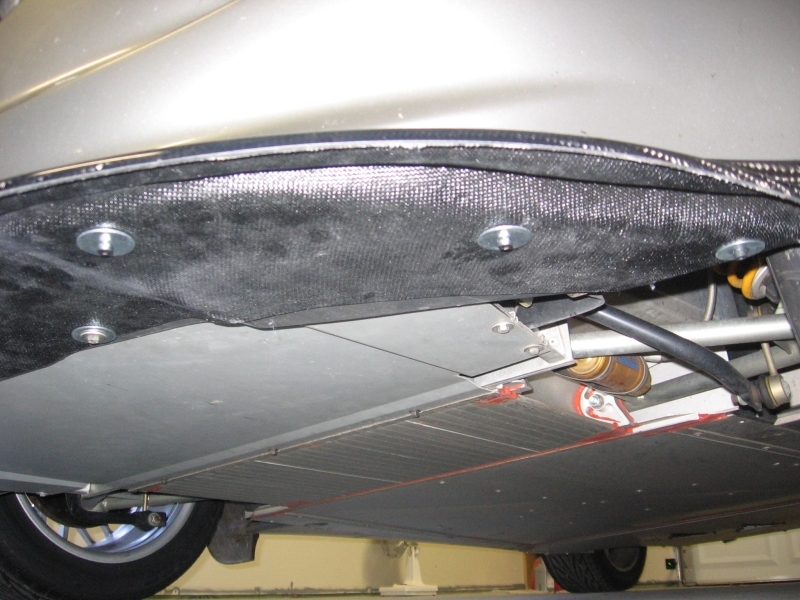 Once up on ramps, I removed the 3 bolts that hold the undertray to the clam that are used for mounting the spoiler. Holding the spoiler centered under the car, I was able to start all three bolts and semi-tighten them, leaving them a little loose for alignment adjustments. Next I drilled the holes on each end, the bolts can be installed with fender washers on either side for uniform clamping and can be accessed in front of the wheel. 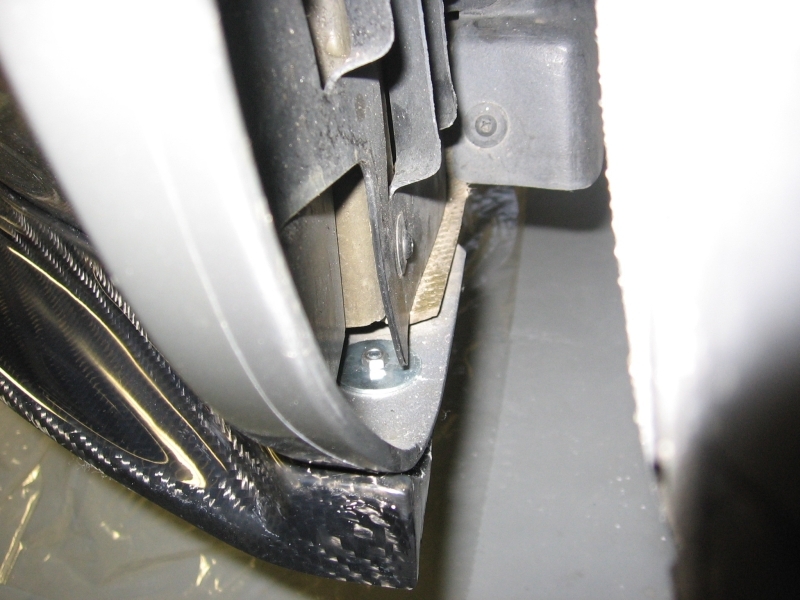 I then drilled the center front hole, the access to this bolt is a little tight but can be accomplished by removing the center grille (held in by clips on top) and wedging your hand down behind the front license plate area. The remaining 4 bolt holes were drilled after tightening down the middle and end bolts, I found that the spoiler is pulled into an almost perfect fit after these bolts are tightened. I used the same bolts as elsewhere in these four holes but was able to get them hand tight without using nuts on top, if I find they get loose I can access these from the front wheel area with liner removed and install the washer/bolt. FYI, I did initially try self-tapping screws but found they offered little support when used with the fiberglass clam - it is worth the additional time to use bolts and nuts. 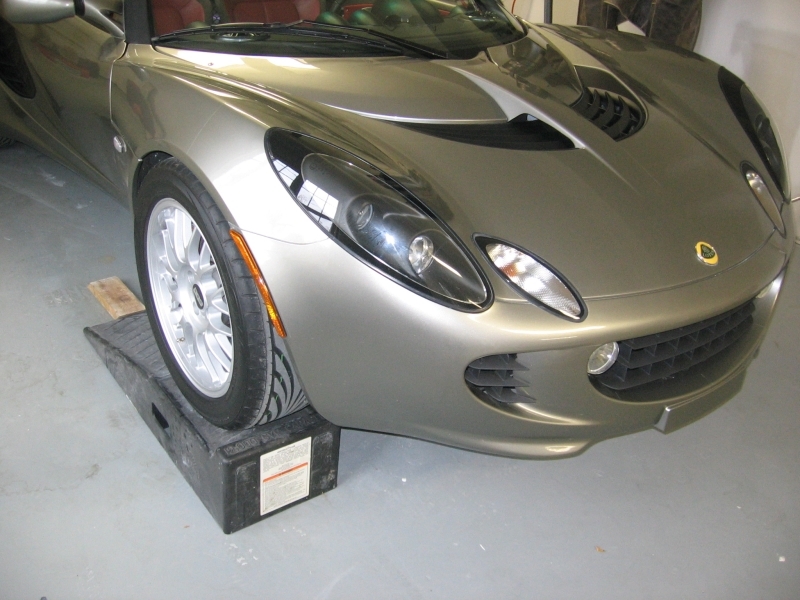 I am pretty pleased with the results, gives the Elise a more finished look up front and is cheaper to sacrifice for survival of the front clam if it is ever bottomed out. ....I am pretty pleased with the results, gives the Elise a more finished look up front and is cheaper to sacrifice for survival of the front clam if it is ever bottomed out. Looks great! Now where's the rear wing? 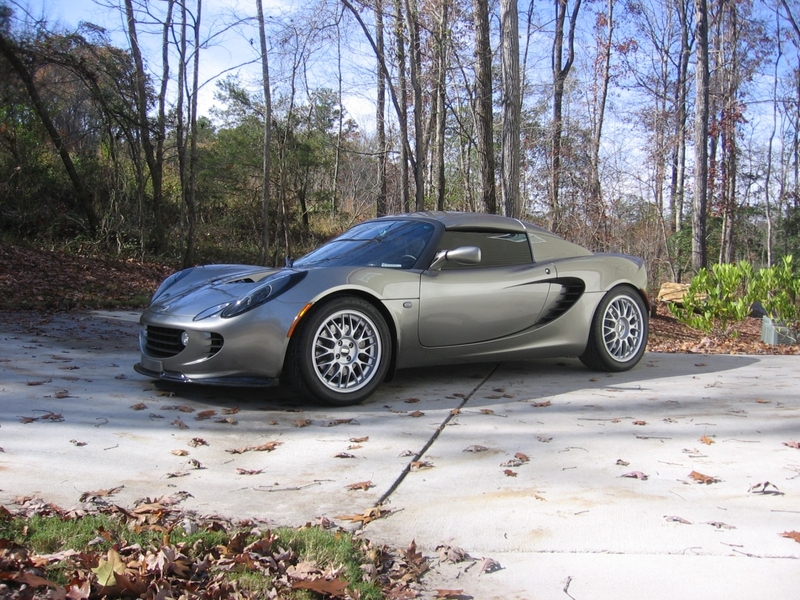 '05 GG Elise - GUT CF Wing/Splitter, RAC Monolites, Stage 2 w/ ported Header, Reverie CF seats, Sparco Lumbar, Reverie Daytona Induction w/ CF side Scoops, Revozport CF vents, B&M Shifter, ACT HD clutch, Ultradiscs, Safecraft 6-pt belts,QR Momo Steering wheel, Polished extinguisher,HID kit, Alpine w/ JL Stealthbox, painted Console/Calipers, Black Diffuser/Nose & Wheel badges, tinted windows/signals, tow hooks. Last edited by MethodX; 11-17-2006 at 01:55 PM. Installed the spolier yesterday. I used the same hardware as noted above. Since the nuts were rather small, I glued them on the fender washers. 2005 Storm Ti, LSS, Touring. Excellent job on the install, much better than what I did. Mine ended up coming off on the way to Livermore, CA. The downforce on the spoiler ripped if off of the front bolts and only the three in the rear (which go into the chasis) were holding it on. However, I did not have the CF one, so it gave me a good excuse to upgrade. btw, how do you like your Toyo T1R's (or is it TR1's)? I did not like mine very much. 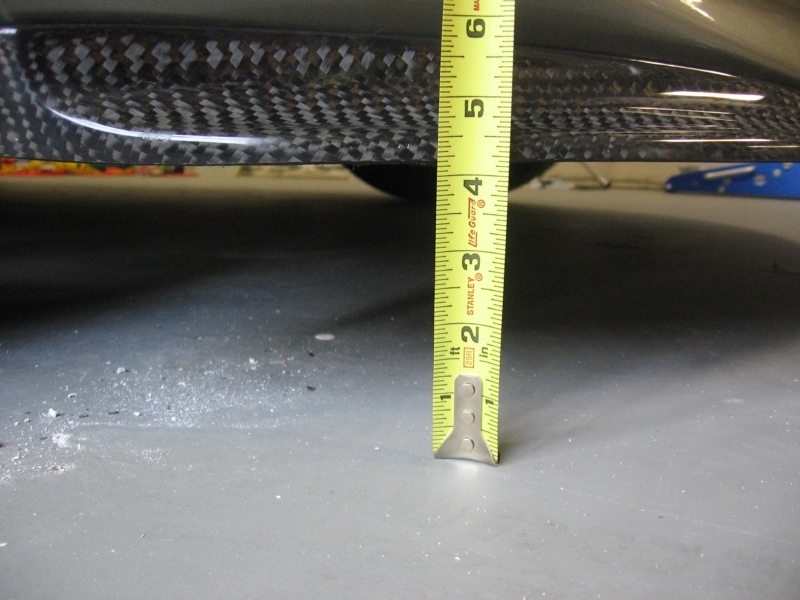 I had a 205 front, and my dry braking distances increased over my 175 Yoko's. I'm still undecided which one i'd get of the two options. Anyone have pics (of either) on Racing Green? Without the rear wing: Does this not make the rear end come out even more. Downforce in front, lack there of in the rear. Has anyone felt the effects yet or is this just an expensive clam guard ? this is a very nice item. 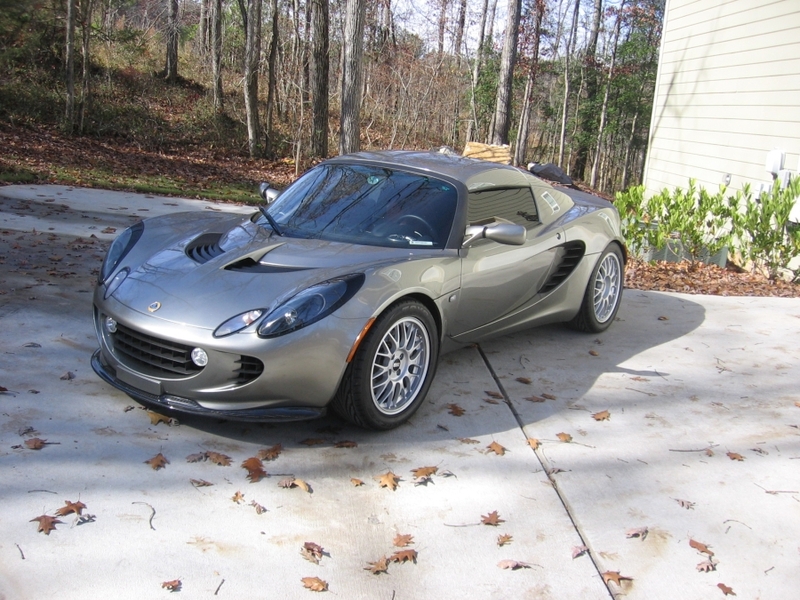 maybe the best of every front splitter lip for Elise. i say this because i would like a simple splitter like the Exige one, but it's impossibile to find one and maybe doesn't exist. very very very nice item, but the member disappeared and no more pictures of his work. maybe there was a big gap too with a lot of space from lip and clam of Elise and it is also impossible to find this item on the net. now ForceFed is selling the first item for $. 399.00 and maybe i will order it, i wrote them to ask them for shipping cost (maybe too expensive for Italy) but they don't answer me and i don't receive any answer from them. BIG help as always Bill! Just ordered my FF splitter! What were you doing at 130mph? Had mine installed earlier this week. Had the clam reinforced first before doing the install because I had bottomed out and scraped the winglets a little. The fiberglass looked thick and should hold it up really good. I would remove the access panel behind the 3 bolts to secure the bolts and use the largest washer available. Also be careful drilling into the clam as their is an oil line connecting the 2 oil coolers. 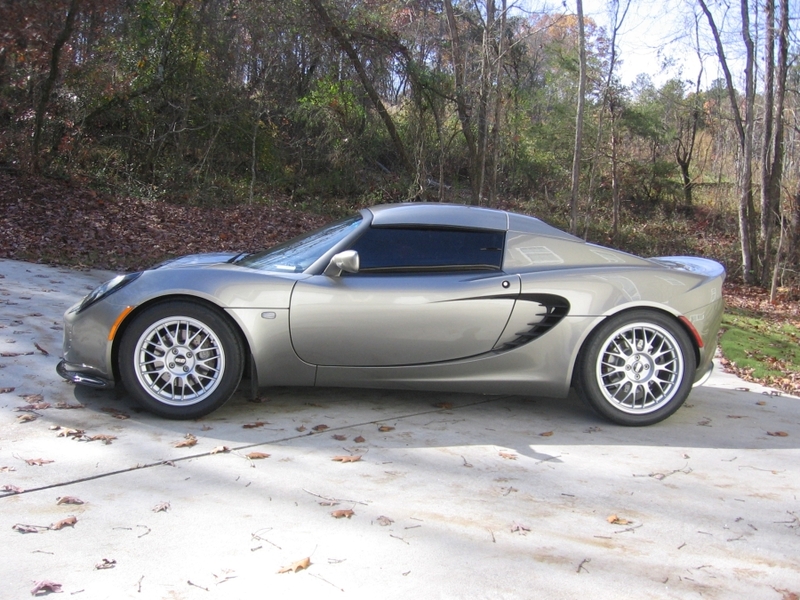 2005 Elise,Touring & Sport,Bordeaux Red Pearl + mods. It's been many months of driving with the Forcedfed CF front spoiler and its a great product. Only thing it needed after almost a year was a touch-up. I decided to tape up the front of the car and paint the bottom half of the spolier to get rid of all the scrape marks and rock chips. Before I painted it I sanded with a sanding sponge. I used Krylon Fusion in satin black and it came out looking brand new. If you look close on the right side you can see a larger scratched area..that was a curb from a track event but now it looks almost like a logo engraved in the side of the spolier. I could have used bondo or something to smooth it down but I really didnt care. I just wanted to share an idea if your spoiler needs a touch up...came out great and took less than an hour. I am interested in your spoiler/splitter like you did for Kaz. I sent you an email but haven't heard from you guys (it's been a week). I like to know the price, and if possible order one. Your PM box is full!!! Sorry I did not see your email,,, I just re-checked and no email about the splitter. Call for more information please . I'm also extremely interested in the exact same setup Kaz has. I too emailed forcedfed literally 1 year ago this month along with a few "reminders" here and there and haven't got a response. I mean, I can order it today if the price is right. Let a brotha know.